CDCLarue Industries Inc. has introduced the Pulse-Bac 1000 Series. The series consist of three new models: the PB-1050, PB-1150 and PB-1250. All three models are equipped with an exclusive CDM system that lowers dust and debris inside the tank during operation, preventing the debris from continually cycling up to the filters. Also included is a tank capacity sensor system that warns the user when debris has reached a predetermined level. If the user does not empty the tank or shut off the machine in a timely manner, the TCS system will automatically shut off the vacuum. All Pulse-Bac dust collection systems come equipped with filters that allow the Pulse-Bac filtration systems to capture dust particles as small as 0.1 micron. 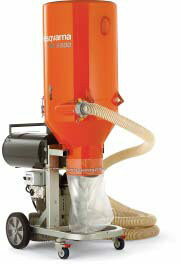 The compact CS 1500 wet/dry vacuum from CS Unitec Inc. is ideal for concrete and masonry dust and debris cleanup. The vacuum's heavy-duty plastic polyfilter bag holds up to 10 gallons of fine dust and allows for simple, safe disposal of waste. Additionally, the CS 1500 can be used with a porous slurry filter bag to capture the heavy waste encountered while drilling or sawing wet concrete. The CS 1500 features a water detection sensor with automatic switch-off when the maximum filling level in the tank is reached. The vacuum has a 13-gallon canister volume and a 25-foot cord. To maintain maximum airflow and suction power, the CS 1500's Electromagnetic Pulse Filter Cleaning System automatically shakes dust from the dual-filter system. The filters efficiently remove 99.93 percent of particles 0.3 microns and larger. HEPA filters are also available. Also included is a nonstatic 15-foot heavy-duty vacuum hose that maintains its shape without kinks or knots. 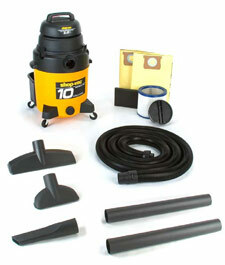 Optional accessories include a heavy-duty cleaning kit with wands, hose, crevice tool and floor-cleaning tool. The DC3800c Twin Turbo from Dustcontrol Inc. is powerful enough for most applications, yet can be moved and transported easily. It has a pre-separator and a filter unit on the same chassis. Eighty-five percent of the collected dust is separated out of the airstream in the pre-separator, allowing the filter to operate longer before cleaning is required. The full line of Twin Turbos ranges from a small 115-volt unit to a three-phase power, 10-horsepower unit. A line of air-powered units is available as well. The DustBuddie dust shroud from Dustless Technologies is designed to fit all major makes and models of hand grinders. A 5-inch size fits both 4-inch and 5-inch grinders, and a 7-inch size fits 7-inch through 9-inch grinders. The DustBuddie is made of durable clear polycarbonate for improved visibility. It is easy to install - once the existing guard is removed, simply slip the DustBuddie around the collar and tighten a band clamp. It features a removable front lip that enables an operator to grind up against a wall. This lip quickly and easily snaps in and out of place to maximize productivity. The brush skirt provides a cushion to help support the grinder and promote better control and smoother grinding. The DustBuddie comes with an optional cover plate that enables an operator to perform dust-free tuck-pointing, decorative concrete cutting and crack chasing. 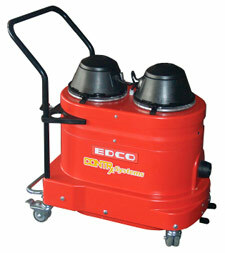 The Vortex 200 vacuum from EDCO Inc. is ideal for collecting concrete dust. It attaches to a variety of EDCO machines, including grinders and saws. The vacuum features a 110-volt, 3.2 horsepower motor and has an airflow rate of 200 cfm. The tank capacity is 9 gallons, and a micro-clean filter is guaranteed for three years. A larger version, the Vortex 290, is also available. The Hilti Corp. TE DRS-B Dust Removal System clips onto all recent Hilti demolition hammers and combihammers. It reduces the operator's exposure to fine dust while increasing productivity. Ideal for demolition, surface renovation, excavation and many other breaking applications that generate dust, the TE DRS-B quickly attaches to the tool via a belt clip, with no screwdriver needed. Throughout the demolition process, the TE DRS-B captures both heavy and fine dust and whisks it away to a vacuum. A unique inner ring prevents the intake of large pieces of concrete or other materials. A two-chamber air-flushing system not only collects dust from the working surface, but also removes dust from the end of the chuck, helping to keep the tool clean. For durability, the TE DRS-B is made with long-lasting rubber. HTC Inc.'s iAD vacuum series is comprised of the HTC 5 iAD, HTC 10 iAD and HTC 15 iAD. 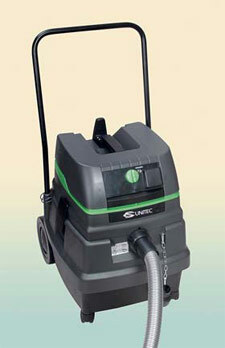 The series offer several advantages over traditional vacuums. Features include an integrated pre-separator, automatic cleaning of filters, and maximal separation of small dust particles. Sizes range from 4 horsepower to 12 horsepower, with air intake at 293 cfm to 883 cfm, depending on the model. The DC 5500 from Husqvarna Construction Products provides industrial strength and performance for demanding industrial applications when high suction and flow are required to eliminate airborne dust. This mobile and versatile unit can be used for both wet and dry applications when coupled with the Husqvarna PG 820 or PG 680. 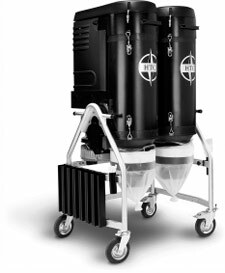 The DC 5500 has a three-way filtering system for efficient containment of dust and boasts an efficient particle filtration rate of 99.9 percent at 1 micron. The vacuum is quiet in operation and compact in design. 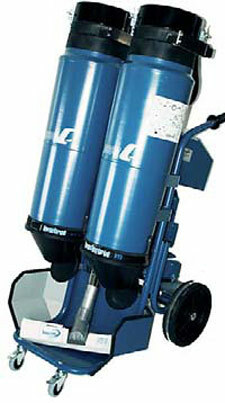 Its unique bag-disposal system keeps messy and hazardous substances contained. Kut-Rite now offers a new line of vacuums. The KleanRite vacuums are available in two models, the KRV15 and KRV25. Both models are equipped with self-cleaning Reverse Flow Technology, operate below 67 dba and are capable of operating wet or dry. The KleanRite KRV25 is the more powerful model, generating up to 300 cfm. The KRV25 comes equipped with standard features that include 110-volt/220-volt operation, a quick-release debris removal tank, and an ergonomically designed mobile cart. The KRV15 has an airflow rate of 140 cfm. The reverse-flow filter-cleaning technology helps ensure constant suction for any application. The ergonomically designed transport carts provide excellent maneuverability and enable simple transport from job site to job site. 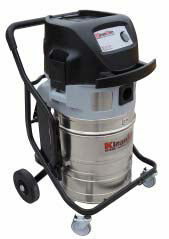 Dust extraction is a snap with either the tilt-tank or drop-tank option. Specially designed plastic or paper bags minimize contact with the debris collected. 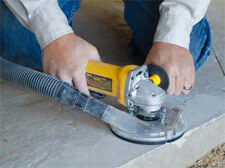 Shop-Vac Corp.'s Drywall Vac is ideal for cleaning cement dust and other fine particles. The Drywall Vac has a 5-horsepower motor, 10-gallon plastic tank, 18-foot power cord, rear tool basket, and wet or dry fine-particle pickup filters. Other features include a 12-foot lock-on hose, a 14-inch floor nozzle, and extension wands. Lavina vacuums from Superabrasive Inc. (models 1150, 1250 and 2150) feature patented self-cleaning Pulse-Bac technology and provide maximum operational reliability. They are ideal for vacuuming up fine powders when working with concrete, terrazzo and any other noncombustible dry material. The filtration technology automatically and continually flushes dust and debris off the filters while you work, preventing them from clogging and helping the machine maintain lift and suction from start to finish. 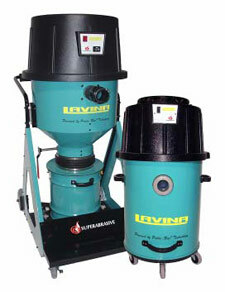 The Lavina 1150 and 1250 models are lightweight vacuums suitable for use with smaller and medium-sized floor grinding and polishing machines, whereas the Lavina 2150 model is a more powerful vacuum designed for large machines. The Lavina 2150 vacuum also features a tank sensor located inside the upper collection chamber, which warns the user when debris inside the collection chamber has reached a predetermined amount.